The strategy consists of the purchase of OTM puts (although they can also be ITM or ATM) and the simultaneous writing of ITM puts with higher strike price, on the same underline security with the same expiration date. It is a credit spread because the money we have to pay for the long put is less than the money we earn from the written put. When we believe that the price of the underline will rise until a certain level and the implied volatility is relatively high. The bull put spread is gaining in value as long as the stock price is rising. We accomplish the highest possible profit at expiration when the price of the underline is equal to or higher than the higher strike price of the short put. Maximum loss: (Higher strike – lower strike) – net premium earned + commissions. Maximum profit: Net premium earned – commissions. Below is the profit/loss diagram of the bull put spread strategy. The long put has a strike of $25 and premium $1 and the written put has a strike of $30 and premium $4. Notice that the profit/loss diagram is quite similar to the call bull spread strategy. 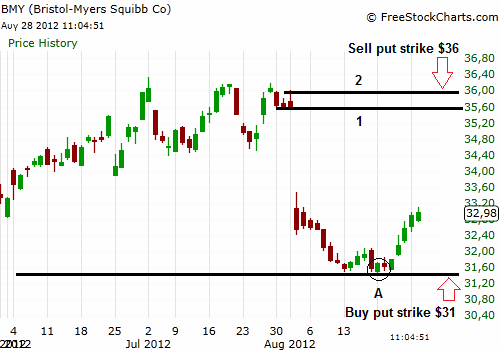 In the daily chart of BMY below, price has visited for the first time a support level (not shown in the chart for space reasons). The market (SPY) is in uptrend and we believe that from point A the stock price will rise within an one month period, but it will not exceed $36 due to the presence of a strong resistance zone (between lines 1 and 2). The implied volatility is also high after the steep decline of the price on the support. So, we can buy the put with strike $31 and write the put with strike $36. The expiration of both should be after one month. As long as the stock price keeps on advancing the spread will be gaining in value. Of course we can close the whole position at any time before the expiration. In case that we believe that the stock will rise far above $36, then it should be better to implement a different strategy because put bull spread imposes an upper limit to the possible profits.